To survive, multiplexes must combat the growing popularity of streaming video and digital downloads. When people can stream Netflix or Hulu on their smartphone or television, or rent the latest titles without having to leave the comfort of their own home, why bother paying $12 for a movie ticket? Likewise, Hollywood studios have been responding to physical media and home theater phenomenon for years —which began with VHS tapes, then DVDs, now Blu-ray and digital downloads, along with impressive home theater offerings including digital projectors, 4K TVs, and ever-larger flatscreens. Their solution was to produce more event movies to drive people to the theaters, resulting in an endless stream of tentpoles and would-be blockbusters. The major studios now want to draw the most viewers possible into the theater, and virtually every movie resembles either Star Wars or Harry Potter. Theaters have needed to make moviegoing an exciting experience again, something worth the inconveniences audiences suffer by leaving the comfort of their own homes. Some have responded by offering new amenities designed to make seeing a movie effortless, as well as combine other experiences into moviegoing. For example, many theaters now offer restaurant-quality consumables (hamburgers, fries, alcoholic drinks, etc.) instead of the usual concessions (popcorn, soda, candy, etc.). That restaurant-quality usually resembles Applebee’s, but no matter—it saves viewers a step in a dinner-and-a-movie process, even if it means the entire auditorium smells like cheap pizza because some guy decided he needed a whole 16” to himself for the show. The other major development is assigned seating, which is my real subject here. Not every theater has this feature, but a few in the Twin Cities metro area have adopted it. The process is simple and the benefits many. Just log-on to the theater’s website or that of your favorite movie ticket seller, preorder your tickets, and show up a couple minutes before the show starts to claim your prime seat. Wherever your favorite seat may be in the auditorium, you can get it without having to arrive at the theater 30 minutes before the show, and you never have to deal with “sold out” signs either. There are some drawbacks to this feature, of course. Incurably late people, thinking they have time to spare because of the reserved seat, sometimes wander in after the show has started. That’s true of any screening; but it doesn’t make it any less annoying. (Arriving late should be prohibited at every theater.) Another drawback involves the people sitting next to you. At theaters without reserved seating, you can show up early, get a good seat, and if someone annoying sits next to you, you still have time to change seats before the theater fills. For example, if a loud talker, small child, smelly person, or otherwise bothersome patron sits by you, you can get up and move. But in a theater with reserved seating, if the show sells out and some aggravating moviegoer takes the spot next to you, you’re stuck there. Or if it’s nearly sold out, you may be faced with a tough decision: Do you A) move away from the annoying person to a less optimal seat, or B) enjoy your quality seat and just put up with the person’s annoyingness? It really depends on what seats are available and the nature of the annoyance, I suppose. But my choice is usually A, because once I’ve noticed a particular irritant, it will distract me throughout the screening. This means I have to go all the way back to the box-office to change my seat, just in case the theater sells a ticket for where I want to move. During a recent screening of Mission: Impossible – Rogue Nation, the viewer next to me, a sporty thirtysomething brah, crunched on his popcorn with his mouth open. It’s not the kind of thing worth mentioning to the individual, and the theater was too packed to move. So now I remember the audio of that film having a loud crunching effect from start to finish. But as I said earlier, annoying viewers aren’t exclusive to theaters with these new amenities. 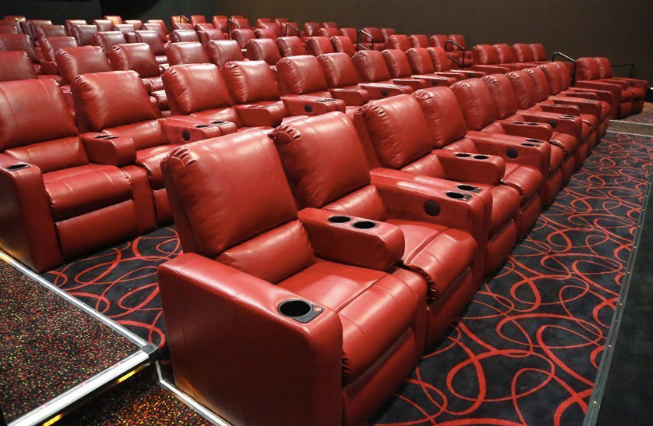 Many theaters that offer reserved seating in Minnesota have upgraded the seats themselves, going from the standard plastic frames with upholstered cushions to recliners made of leather or quasi-leather. These chairs are usually very comfortable and compare to La-Z-Boy home theater seating, complete with a motorized footrest and reclining features that allow you to extend flat. Admittedly, it’s nice to truly sit back, relax, and enjoy the show in seats like these—it’s effective in recreating the experience of watching a movie within the comfort of your home, but in the big screen environment. Unfortunately, there’s a whole new level of annoyances that arise from these seats, and it’s especially troublesome if you’re unable to change seats. My foremost concern is feet. Countless times, the person in the recliner seated next to me decides to slip off their shoes, sometimes their shoes and socks. Remember that scene in Planes, Trains, and Automobiles where John Candy takes off his socks on the plane and airs out his feet next to a frustrated Steve Martin? Remember how awful that seemed? Yeah, well, that happens in real life too. There are all sorts of connotations between socks and smells, so people should already know to leave their shoes on as a common courtesy. It’s even worse when someone removes their socks too. 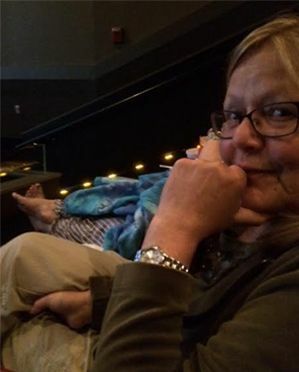 To the left, you’ll see a pre-show snapshot I took of my mom, who looks very judgmental of the woman next to her, who not only removed her shoes before a screening of Jurassic World, but also covered herself with a blanket. If you’re that cold, maybe you should put on some long underwear or a sweater, or maybe just put your socks and shoes back on. This picture is the perfect example of what’s wrong with turning movie theaters into a comfortable-as-home experience. If moviegoers have more reason to treat the theater like their home, and then slobs go to the movies, everyone else has to put up with their bad habits. They fidget with the footrest settings during the feature, sending mechanical sounds throughout the auditorium. They squirm restlessly in their chair, causing loud leathery squeaks. They bring their old, unwashed, stinky blanket to the theater because, hey, they love wrapping themselves up in Mr. Binky and watching a movie at home, so why not at the theater too? Same goes for shoes. They hate having on their shoes on the couch, so why should they have to wear them at a movie? More than once, I’ve been forced to get up, find a theater employee, and ask them to tell the patron to put on their shoes. I know it’s a somewhat petty thing to do, and that I should mind my own business, but it’s better than having to endure someone’s sour-smelling, yellow-toenailed feet. It’s also better than causing a scene in the theater, since moviegoers are more likely to argue with me than a theater employee about the issue. Anyway, in my experience, whether or not the theater employee actually addresses the issue depends on how strongly that employee feels about it and whether they feel like confronting someone. Most theaters don’t have a “must wear shoes” policy. The AMC chain has a 50/50 track record of addressing the issue; the Marcus Theater chain has never me turned down; Muller Family Theaters can’t be bothered with such issues; and thought it’s never happened to me at an Arclight or Alamo Drafthouse theater, I’m positive they would be happy to resolve the matter. Much like talking during the movie or using a smartphone, people forget that the theater isn’t their living room, that they’re actually surrounded by other moviegoers, all of whom want to enjoy their experience. As much as these new features improve the experience, the disrespectful few who remain inconsiderate to the experience of others can spoil such comforts.